(by Helena Horton, The Telegraph, 1/12/17) – A spectacular and beautiful cloud formation was spotted in the skies above Australia by a passenger on an airplane. Ilya Katsman, 22, saw the phenomenon on a Virgin Australia flight from Perth to Adelaide. A spokesperson from the Met office explained to The Telegraph that the cloud is of a type commonly seen in Australian skies, but they are rarely as beautifully distinctive as this example. 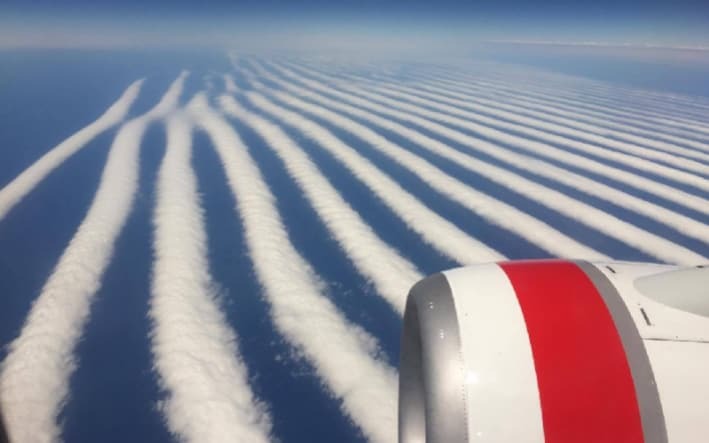 Ms Katsmann wrote on Instagram: “The most unique cloud formation I have seen to date on route from Perth to Adelaide somewhere over The Great Australian Bite”. A Met Office spokesperson explained: “In terms of how they form, it’s about air rising, cooling and then descending again. “They’re most commonly seen in Australia and are most commonly associated with sea breeze condensation. “The rising, cooling and falling of atmospheric waves creates the thin strips of clouds. These clouds could be seen in the UK, but are rarer [there]. The Met office spokesperson said: “We have seen them in the UK before, but not as commonly”. Clouds such as these are locally known as ‘morning glory’. (By Zoe Kleinman, BBC News, 12/26/16) UNITED KINGDOM — ”I’m just a farmer’s wife,” says Christine Conder, modestly. But for 2,300 members of the rural communities of Lancashire she is also a revolutionary internet pioneer. Her DIY solution to a neighbor’s internet connectivity problems in 2009 has evolved into B4RN, an internet service provider offering fast one gigabit per second broadband speeds to the parishes which nestle in the picturesque Lune Valley. That is 35 times faster than the 28.9 Mbps average UK speed internet connection according to Ofcom. It all began when the trees which separated Chris’s neighboring farm from its nearest wireless mast – their only connection to the internet, provided by Lancaster University – grew too tall. Something more robust was required, and no alternatives were available in the area, so Chris decided to take matters into her own hands. She purchased a kilometre of fibre-optic cable and commandeered her farm tractor to dig a trench. After lighting the cable, the two farms were connected, with hers feeding the one behind the trees. “We dug it ourselves and we lit [the cable] ourselves and we proved that ordinary people could do it,” she says. B4RN now claims to have laid 2,000 miles of cable and connected a string of local parishes to its network. It won’t connect a single household, so the entire parish has to be on board before it will begin to build. Each household pays £30 ($36) per month with a £150 ($180) connection fee and larger businesses pay more. Households must also do some of the installation themselves. The entire infrastructure is fibre-optic cable right to the property, rather than just to the cabinet, with existing copper phone lines running from that to the home, as generally offered by British Telecom. The service is so popular that the company has work lined up for the next 10 years and people from as far as Sierra Leone have attended the open days it holds a couple of times a year. The bulk of the work is done by volunteers, although there are now 15 paid staff also on board. Farmers give access to their land and those with equipment like diggers and tractors do the heavy work. However other landowners can charge – B4RN has complained on its Facebook page about the price of cabling under a disused railway bridge owned by Highways England. 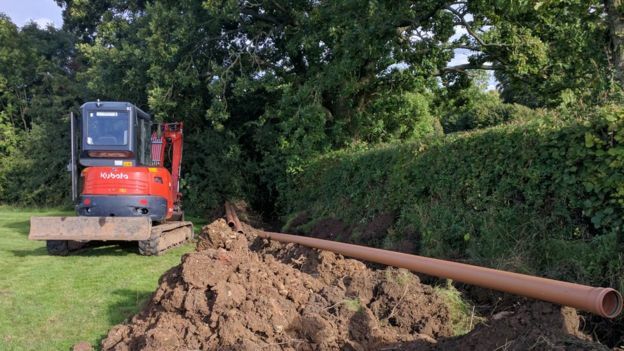 A spokesperson told the BBC these are “standard industry costs” which include a £4,500 ($5,424) fee for surveying, legal fees and a price per meter for the cable installation. While B4RN has yet to make a profit, once it has paid back its shareholders it should be in good financial health – although one of the conditions is that profits must be ploughed back into the community. Chris’s services to rural broadband have recognized by the Queen – she was awarded an MBE in 2015, alongside Barry Forde, a retired university lecturer who now leads the co-operative. Incredibly, many B4RN customers had been surviving on dial-up services or paying high fees for satellite feeds. Chris says that some still are. With farmers having to register online with the Department for Environment, Food and Rural Affairs (Defra) within five days of every calf being born in order for it to enter the food chain, connectivity is vital. “All the farmers who haven’t got broadband have to rely on land agents or auction marts or public wi-fi spaces which we haven’t got round here either, or paying somebody to do it,” says Chris. “What the farmers were finding was the dial-up just couldn’t cope with it. “They bought satellites, but then the children would use all the satellite feed to do their things and then they came to use it at night and there was no feed left, they’d gone over the data and they were being charged a fortune for what they then used. “So the farmers have been incredibly supportive of this and that’s why they’ve given us free rein throughout the fields, which we go through to connect them and then we get to the villages which subsidize the farmers’ connections. There are other independent fibre broadband providers out there, like Gigaclear which serves around 50,000 customers based in several UK counties and Hyperoptic which is active in 13 cities. They all claim to offer 1Gbps speeds. “The best way to make sure this country catches up is to support the alternative networks,” says Chris. “Wherever there’s competition BT will then up their game. Openreach, currently a division of BT, owns the UK’s largest broadband infrastructure.